Why grow food in schools? All across London schools, local authorities, parents, teachers and local communities are starting to see the incredible benefits of growing food in schools - from health, to education, the community, the environment and even the local economy. Read about the wider benefits of food growing to London boroughs and Our Achievements working with London schools so far. Supporting curriculum learning - Read how Nightingale Primary School, St Scholasticas Primary, Lowther Primary School and John Ruskin Primary School have managed to weave their food growing across the curriculum for different school years. Improving physical health & mental well-being of pupils - Rhyl Primary School, Pooles Park Primary and Charlton Park Academy use their new gardens and allotments to educate pupils and the wider community about healthy eating, and attainment levels at Charlton Manor Primary School have increased since they started on their food growing journey. Connecting schools with their local community, businesses and volunteers - The gardens at Melcome Primary and Mulberry School for Girls needed lots of help to get them started, and Hitherfield Primary School has worked with local businesses to extend their learning around food. Chisenhale Primary received support from Capital Growth and RHS Campaign for School Gardening, and Queen Elizabeth II Jubilee School was helped by their local Council. Encouraging enterprise skills & improving behaviour - Food grown can be sold locally or at marketplace events enabling children to develop their skills, like at Dormers Wells High School. Take a look at these other examples - Young Marketeers, Schools to Market, Growing Enterprise project. Food Growing Schools: London is a partnership that was developed as a response to the Food Growing in Schools Taskforce Report developed in March 2012. The report demonstrates the impact food growing in schools can have and explains why it is such a powerful catalyst for change. 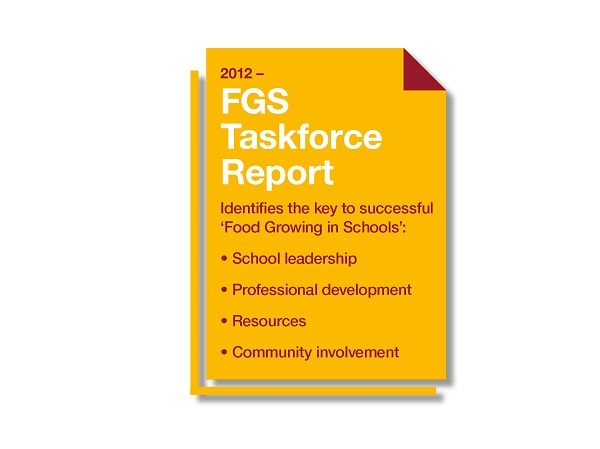 Read the full Food Growing in Schools Taskforce Report. 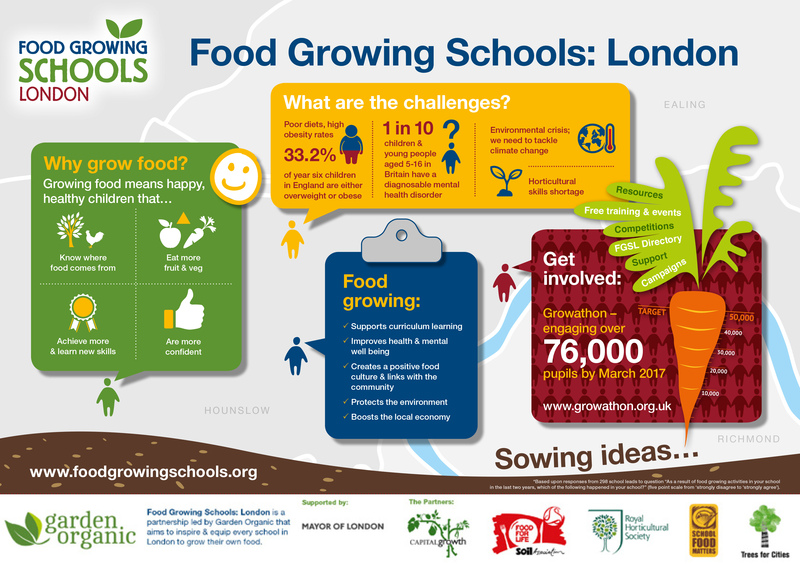 The launch of Food Growing Schools: London (FGSL) coincided with changes to Government school food policy and the introduction of the School Food Plan, Cooking in the curriculum for all under 14s and new GCSE Food Preparation and Nutrition guidelines. Together these changes have helped to improve school food culture, which is having a wider positive impact on our capital’s long-term stability, health and economic future. FGSL continues to work with schools across London with six partner organisations currently involved and continued support from the Mayor of London. An independent evaulation of the first 3 years of the project was conducted by a team at The University of the West of England. An executive summery of the report can be found here.